The day before Mathsgiving Break!! So what if I'm the only one who calls it that! You wanna fight about it??? I collected the open-ended sections of the Geometry test and gave them the multiple choice section. They did, overall, VERY well on that section. I'll grade the open-ended over the break and I expect they will do well on that too. After everyone finished their tests, I talked to them about how much I appreciate the work they have been doing. I was frustrated with them yesterday and I didn't want them to think that I disliked them or didn't appreciate their strengths and effort. I talked about Bloom's Taxonomy and how I want them to be able to create things that demonstrate their learning. I also assigned them to write me a few paragraphs over break about how they think class is going: what they like, what they don't, how things can be improved. If they DON'T say fashion, I will be sad. In pre-algebra, the students were given 7 open-ended problems to work on in groups. Most of the groups worked very well but there were several incidents that confused me. One student tried to turn in 3 problems with half of the class left. I told her there was still time and she should try to finish what she could. Instead of doing that, she crumpled her paper and threw it away. When I asked her why she threw away what she had worked so hard on, her response was "I don't want to do any more and you won't take it now." I don't have any idea how to respond to this. I suppose she was thinking that she wouldn't get partial credit for only doing half of the assignment, but as much as I've been thinking about it, I can't come up with a rational reason for why she would throw away all of the work she did just because she couldn't turn it in RIGHT THEN. She may have had an irrational reason, but when I tried to ask her, she screamed at me about how she didn't care. I'll pull her aside after break and ask her about it. In the second class, only one student followed the direction I gave to put their answers on a separate sheet of paper. About half of them didn't read any of the directions or actually answer the questions that were given. I think when we come back from Thanksgiving break, I'm going to have them redo their work for credit. Seriously, if the question you're being asked has parts A, B and C, and your answer is a single digit, I think something may be wrong. How do you impress on students the importance of following directions and answering the questions being asked? From the 45 pre-algebra students who had a project due today, 2 turned it in. I think when I do projects in the future, I need to work with the class to create a daily timeline of things to turn in. I think many of the students are still at the point of "if it's not due tomorrow, I'll do it later" and on long-term projects, even as long as a week, that's really a detriment. When we come back from break, we're going to have to work on organization and planning as well as math and literacy. Anyone who thinks that teachers only have to know their own subjects clearly has no concept of what this job entails. Thank goodness that teachers get the respect that they deserve! Finally got some clever responses! Since I noticed that I hadn't entered any grades yet, my plan for geometry class today was a two-part test. The first would be individual and multiple choice while the second would be with a group and open-ended. I found an e-mail this morning, however, that said that half of my geometry class was being pulled out for all of period 1, so plans changed slightly. Instead, we spent the period exploring shapes! Yesterday, we talked about the interior angles of a polygon. We explored the idea of creating triangles inside polygons to find the sum of those interior angles. Today, I gave them the same warm-up, but changed the word "interior" to "exterior." This turned out to be a MUCH richer discussion with students making all sort of conjectures, only to have them disproved by other students. Several of them wanted to treat the polygons as though they were regular (the polygons, not the students) but a few others claimed that we couldn't. We assumed that they were so we could talk about a specific case, then changed the angles to talk about a general case. The students came up with a general rule for the sum of the exterior angles of convex polygons and we showed it worked in a few different cases. Then a student asked about concave polygons. So we explored those! Protip: THIS exploration is wildly more interesting than convex. A great collaborative effort brought us to the end of the period and a general rule for the sums of the exterior angles of concave polygons. I was VERY impressed by them. In making a paper airplane, a student folded the top edge of her paper into 8 equal angles. What is the measure of each angle? I don't even know how to begin explaining this problem without giving it away. I think it might be a matter of concentration, reading directions and persistence. After 40 minutes, in which none of the groups finished the 4 problems I gave them, I told them to finish it up for homework and come in tomorrow ready for the multiple choice section. I'm hoping that if they work on it at home (which most of them will) they will see that it's a pretty simple set of problems. It's possible that just being in word problem format threw them off, which means I need to do more word problems. In pre-algebra, we also took a quiz. It was a much more procedural quiz than I would have liked and I could come up with a host of legit reasons why that was, but the truth is that I'm tired and I need to make sure they CAN do the procedural stuff. This group of students has a tendency to give up SO quickly on complex tasks that it's hard for me to even know if they understand the procedural work. The results of the quiz are, however, quite encouraging! With a few exceptions, the majority of the students DO understand the procedures and shouldn't get bogged down by them on more complex tasks. On the other hand, all of the students in pre-algebra have projects due tomorrow and, from the questions I'm being asked, it appears as though not a single one will be turned in on time. I'm hoping this is not the case. I am praying to be surprised. I'm working on getting my geometry students to justify their reasons when talking about triangles (or anything really). I am trying to spend a good amount of time asking them "how do you know that?" and "why?" They hate it, but they are starting to do a much better job of explaining their thought processes and justifying their answers. We spent 40 minutes today exploring the warm-up! We had a great conversation about how to slice the shape into triangles, how many triangles you could make, how to develop a formula, why the formula works, etc. I was very proud of their work. After much consideration about what happened on Friday, I can to a difficult decision about my pre-algebra classes. I decided to show them what my class would be like if I were NOT interested in them. Today, we had a workbook assignment that students worked on for the entire period, silently and independently. One student who refused to stop talking was removed by the principal and taken to in-school suspension. The idea was that, if they saw what my class COULD be like, they would be more liable to appreciate what it IS like. It backfired horribly in the most productive way ever. I was reminded that many of my students would MUCH rather work on grinding through problems than tackle anything of substance. They were able work solidly for the entire period with minimal issues, asking questions when they needed help and, in general, producing correct answers. I have never been more disappointed in student work. I feel as though I should be happy that they worked well throughout the entire double period, mostly staying on task and completing the assignment that was set out for them, but I'm not. I'm sad that they would rather spend 90 minutes doing rote calculation than producing something of substance. I know why this is the case. I know why they want to do worksheet after worksheet. They are easy and they are comfortable. Even when the problems are more difficult, the process is familiar. What I thought of as a punishment (something boring) turned out to be a reward for them. They didn't just do it grudgingly, they did it with glee and joy, having conversations across the room about how to find the answers and which strategies they used. They were doing everything that I wanted them to do LAST week. So I am torn. Do I continue letting them do the menial work to allow them the feeling of enjoying doing math inside of their comfort zones? Do I push them beyond that comfort, knowing full well that even though the content is more interesting, they are MUCH less likely to even attempt it? I think this is why teachers often don't bother to develop interesting lessons. They are happen to listen to the more interesting topics, but getting them to do the work themselves is like pulling teeth. They don't want to listen to me lecture about procedural stuff, but they'll sit and do it for hours. What are we training these kids to be? What are we training them to do? And so I have come to a major short-coming of mine as a teacher. I don't know how to explain to them that they are putting their effort and energy into the boring stuff. I had thought that showing them what they could be doing would excite and interest them, and it does! Provided they don't have to do any work to get there. How do I save these bright young minds from the assembly line? After all this time, I finally added a joke! I am at war with myself. On one hand, my geometry class seems willing to go with me no matter where I lead them. They will try any insane project and have absurd discussions with me about dark matter and gravity and what it would be like if the moon disappeared and how to build an electromagnet. They fight with each other to ask better questions that lead us into more interesting depths. I don't check homework, but they do it anyway. They are curious. On the other, the majority of students in my pre-algebra classes fight me every step of the way. I try to find out what interests them and they put their heads down. They don't do homework whether or not I check it. They don't care about grades any further than "am I passing?" We Skyped with Mrs. Neil's classes in Florida today and I was embarrassed by the way my students behaved. I had hoped that it was simply the mix of students in my first class coupled with the fact that half of them are new to my room. The second class, however, acted about the same. For the most part, the majority of the students behaved very well. A few, however, made it very clear that they were not ready to participate in such activities and, as a result, will be excluded from them next time. It is a struggle for me not to be angry with them. A part of me recognizes that they are teenagers and giving them new experiences is something for them to be excited about. That same part also recognizes that our current educational system doesn't prepare them to behave in an appropriate fashion. It rewards those who blindly follow at all times and those who don't are punished. There is very little explanation of when they SHOULD simply do as they are told and when they should express themselves. I spoke to them beforehand about my expectations, that if they shouted out no one would be able to hear anyone else. I told them that the one mic was very sensitive and all background noise would be picked up and transmitted. They carried on as though were on a playground. I feel as though I spent half of the conversation telling them to be quiet so we could hear what was being said on the other end. Mrs. Neil's students were sitting in their desks, politely listening while mine screamed at each other and at them. I had to relocated several students because they were simply incapable of being quiet. After the call, when we attempted to get back to our regular classroom, the students refused to get back on task. After trying for 15 minutes to finish a single problem, I decided that I was simply done. My 4/5 class received a 20 minute lecture about how school is boring because they make it so. I explained how it feels to be a teacher who wants his students to be interested and engaged, so he spend time developing lessons and connections to help them express themselves and experience things that they wouldn't otherwise experience only to have those same students treat those efforts with a nauseating level of disrespect. I took, and take, much of the blame on myself. My early success made me cocky about my abilities to engage the group. The level of rapport that I had built with them caused me to think that they would simply do what I asked, trusting that I was trying my best to make it interesting for them. As positive as I have been this year, those thoughts are starting to crawl back in. My coworkers have seen remarkable changes in me this year. Several of them have asked me what happened over the summer to completely turn my attitude around. Many of them don't even recognize me anymore. I had thought that with all of the changes I had made, this year would be different. In many respects, it is. My geometry class is doing remarkable things, but I don't know how much of that is actually me. Most of those students have VERY supportive and involved parents who would be pushing them anyway. The pre-algebra classes, however, are the same as last year. I firmly believe that there are students who need help and an educational environment that I simply cannot provide with 25 other students in my class. They will be able to excel in a place where they can receive more attention than I am able to give them. I know that lots of teachers say things like "God, I wish I could get that kid out of here!" but that isn't what I'm saying. These are bright and capable kids, but they are not in the environment that best serves their needs. I would happily help them, but I don't know how. It wrenches my heart to think about the amount of time and attention that has to be put towards those students when I have so many others who need me as well. I don't feel as though I am serving my students well. I am serving them better this year than I think I ever have in the past, but I'm nowhere near where they need me to be. They need skills that I don't know how to teach. I don't know how to reach them. I don't know how to reach them. Or maybe it has just been a bad week and things will be better next week. This is a confusing job. I left myself a note to find on Monday. Steve Kajari is a 3rd year teacher in Austin, Texas, who has the privilege of teaching high school algebra and geometry. A few days ago, he posted on Twitter about a lesson in which his students made paper airplanes. It looked amazing, but when I asked him to blog about it, he admitted that he didn't have one! So I offered to post his write-up on this blog as a guest post and, thankfully, he agreed! He needs tons of peer pressure to get him to start his own blog and share more of his amazing lessons like this one! You don't challenge kids unless you challenge yourself. Every week I have the goal of engaging students with kinesthetic activities to create / explore the curriculum in Algebra but I’m not always sure how to do it in a novel and honest way. CBRs? Have already done that this year.. what else could I do this week? Then a suggestion from a student during a prior class rang in my ears -- "Mr. K, you should totally let us build paper airplanes and launch them off the top of the balcony. Then we would learn about starting point (which is what I called "Y Intercept" when I promised them they would explore it during the next class). After a day of thinking, I was convinced that this student was right. They WOULD learn about Y Intercept and it didn't matter that the idea wasn't mine. In fact, it was better that I didn't own the idea. But how to implement it? Even worse, what would it look like? 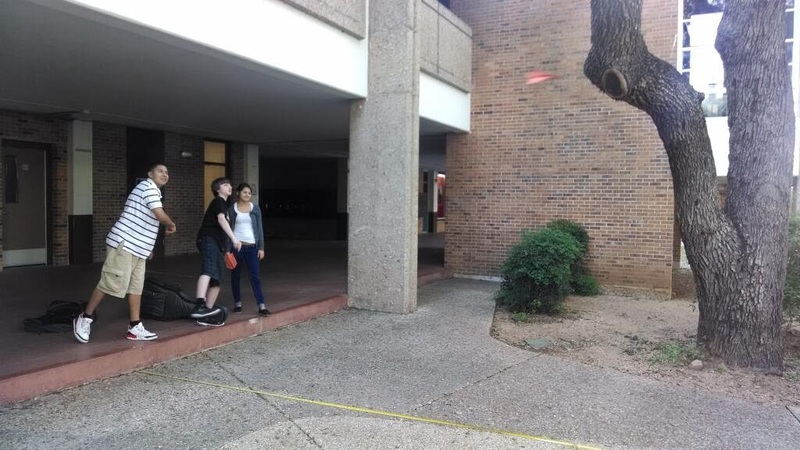 Kids in the school courtyard (behaving like 9th graders do), throwing paper planes around. Does it even look like learning is taking place? Does it match the curriculum and standards for a subject that is currently evaluated with an EOC / STAAR state standardized test? IS learning taking place and how will you know? What constitutes failure? Where do problem solving / exploration meet the rigor of applied math that our state standards (TEKS) demand? Luckily I have an administration that appreciate that the standard model in math has been (for too long) constrained by the boundaries of the textbook and the format of formula driven learning. We're told that kids connect memory to emotion and that kinesthetic activities are GOOD, but after being told this in a professional development, the expectation is often the opposite (break out the worksheets!) For me this year is one of the first to not fall victim to the above paradigm as I've had great freedom, support and encouragement from my PLC and admin regarding engaging kids on their level with relevant, challenging "in the moment" experiences that spotlight what the curriculum is aiming for -- which leads me to a nice lesson plan (or lack of one) that encourages kids to define for themselves what a Y intercept REALLY is. 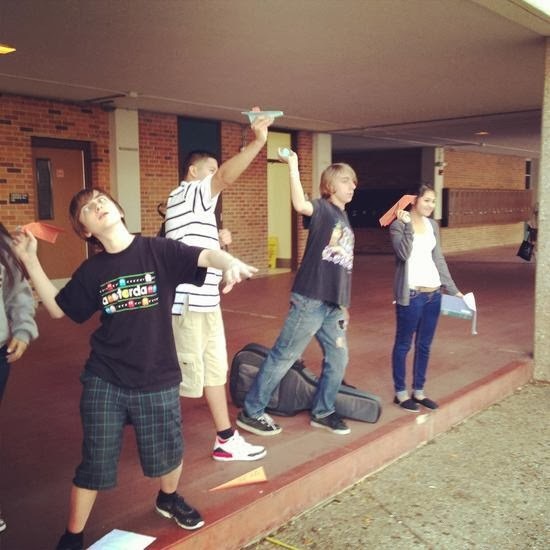 1) Kids enter the classroom and an overhead announces to them that their bellringer / warmup is to build a streamlined paper airplane with the available sheet of construction paper, which they will then fly in the courtyard (not off the balcony!) and time as an experiment in what "Y Intercept" really means. The kids have a piece of construction paper and a sheet of graph paper to pick up on their way into the room. 2) The second part of the bellringer announces that while both students can work on the design, one student MUST make sure that their team has a timer / stopwatch on their smartphones. Our kids use their electronics too much, my challenge is showing them HOW to use their electronic devices properly as adults. 2.5) It occurred to me, at this awkward moment in the exercise, that some kids did NOT know how to build a paper airplane. Really? You're giving kids the chance to launch a paper plane across the 'classroom' *for credit* for the first time in their lives, and their response is "I don't know how?" Again, this addresses how google is such a great resource and SHOULD be used by them as a starting point and reference in generating solutions. REFERENCE, not crutch. 3) On the next overhead there is a quadrant for graphing. There is no scaling and no information. Some questions are addressed. "You're building an awesome paper plane that's better than almost any other plane ever built. How far is it going to fly? How long should it take?" The overhead poses the question "Does Distance Depend on Time, or Does Time Depend on Distance?" which might be a particular quirk of mine, but I find most of the struggle in teaching domain / range and independent / dependent, or even in generating a graph comes down to "where to put what" and "what does which one mean"? Consequently I don’t let students do anything until we all agree what to label where. 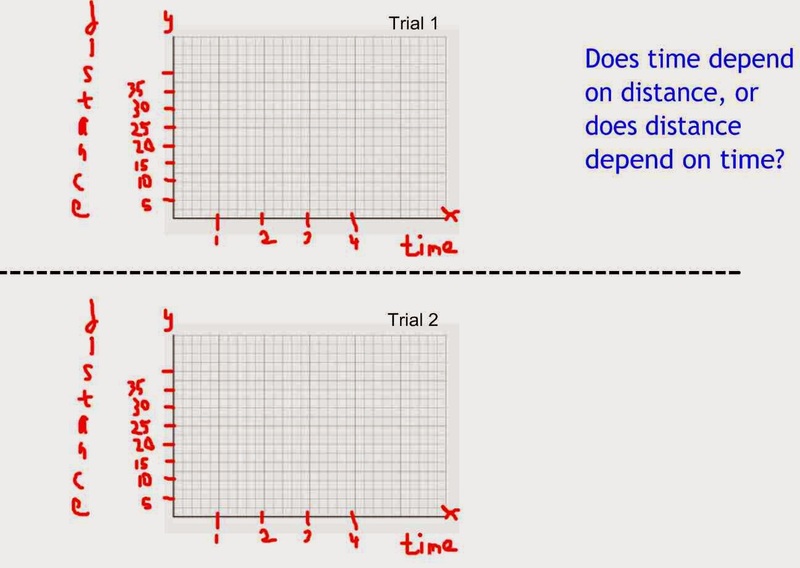 When students incorrectly (and they will) say that time is dependent on distance, you can point out to them that time DOES NOT slow down or speed up depending on how far they throw their paper airplane. So much for sorting dependent vs. independent! Done! My class is very familiar by now with knowing that the X, or input variable, is put along the bottom of a graph. The conversation at this point should then transition to scaling, and should be up to them. How far will their planes fly? How long will they be in the air? After a while, if students have to repeatedly estimate domain and range, they begin developing some reasonable guesses. Once the class decides and we know how to label our graph, we fold the graph paper in two "hamburger" style. The class is told to replicate our graph design on the top and bottom of the paper since we will be doing 2 trials. Almost all of my classes revolve around my concept of "the Do". If you're writing or told something, you're not learning. If you're DOING something, then there's a connection being made. Journey to some place where you have ample physical space -- student paper planes can fly around 35', believe it or not! Have your students line up behind a line of masking tape or other starting point. Stretch out a tape measure on the ground (thank you Dollar General!) in front of them. Have their teammate, timer at the ready, stand to the side. Ready, Set, Go! Record the data as a discrete point. OK, now time to have a discussion. We've created a graph. Labeled and scaled the axes. We know that we are comparing time and distance. Now we have ONE ordered pair to graph. What does that mean? We've NEVER had just ONE ordered pair to graph. Really, ONE dot? But what about where we STARTED from? Isn’t that a point, too? Have them come OUT to about the 30' mark on the tape measure, reverse the positions of the stopwatch / timers, and have them throw the paper planes BACK towards where they originally started from. If you're still paying attention, you'll realize that their starting point is NOW about 30 feet INTO the graph, and that their distance will be decreasing, NOT increasing. *All* important stuff for kids to deduce when it comes to this topic. It was easy for us as we set the exercise up as “Distance Plane Went Into the Courtyard” so they already kinda knew that trial 2 was going to show less distance than trial 1 did. They recorded the ordered pair of stopwatch time and location along the tape measure on the graph. AND about 90% of them immediately connected this to a Y Intercept of (0,30) on their graph without being told. As my classes are 90 minutes long (and the above is just a discovery meant to “activate” / turn the kids’ brains on), the transition to a good, quality activity and discussion after this is crucial. My kids did the lesson “iCost” on www.Mathalicious .com which allowed me to ask ALL of the same questions we had explored in the discovery activity. This time, however, it was as part of application rather than discovery. The iCost activity gives students 2 ordered pairs to graph – iPad cost and iPad hard drive size. They’re asked to plot the cost of the 16GB iPad and the 32GB iPad, and then to predict what a 64GB iPad would cost (I say ‘would’ because there’s no such thing! Nice trick to eliminate google cheaters). Best aspect of iCost is that, as students trace their line back to an iPad that has 0 GB, they are confronted with the confusing fact that the unit STILL supposedly costs around $400. Out of about 70 students that I “prepped” for the iCost lesson with the paper airplane exercise, almost every one down to the very last student had no problem quickly stating that the $400 was the starting point! They didn’t think it was fair to have to pay for the plastic, the aluminum, the glass and the electronics that the iPad was made out of, but they DID understand that some Algebra problems start from the origin and SOME have a starting point that might be quite different. Kudos…. Great job kids! If you are interested in writing a guest post, please let me know! I got fantastic answers to the question I left for them yesterday! The sub said they came in looking for it. They know my expectations! I'm so proud of them! So today, I asked the obvious follow-up. After my craptastic lesson in geometry on Tuesday, I put out a call for help, and the amazing @JenSilvermath answered! She linked me to an activity that was similar to the one I had them do, but with more structure and with less room for human error (i.e. rolling straws, or the need for a protractor). After a bit of a rough start where I had to repeatedly emphasize the need to read the directions, the students seemed to really enjoy this activity! The activity itself revealed lots of interesting information about the students strengths and weaknesses. Many students will work amazingly hard if you guide them through. Others prefer to be left alone and figure it out on their own. It's also interesting that the students who ask the most questions are the ones who spent the least amount of time reading the directions. All of my classes have students that require hand-holding, but the difference between the students in geometry and pre-algebra is the type of hand-holding. In pre-algebra, we spent the first of the double periods talking about estimating square roots. When I told them to put the calculators down, they just about peed in fear, but we managed to get through it. I need to start using Estimation180. Even after a tutorial on making reasonable estimates, it seemed that many of the students either didn't understand, or just enjoyed yelling random numbers. For the second of the double period, students were allowed to work on their project planning sheets, their passion projects or book work, depending on their choice. Many of the students in my 4/5 class spent the time walking around, surveying each other about show size and price or using the hanging scales to weigh their shoes. My 8/9 almost entirely chose to do book work. I attribute this to the fact that it was late in the day and the kids were exhausted, the idea of walking around the room, weighing shoes, was simply too much of an energy drain. Tomorrow, we will be Skyping in with Mrs. Neil's classes to talk about Genius Hour. I have told my students to have questions ready. I'm very excited to see how this Global Collaboration is going to go. I don't expect the first one to be perfect, but it will still be a great experience for my students, her students, her and me! I would love to be able to Skype or do a Google Hangout with classrooms around the world, getting my students to be open their minds and branch out in their worldviews. I can tell that we are getting close to a break because the kids are starting to get restless. Their attention span has shortened, as has mine. Attendance is starting to fluctuate and there are more fights and insanity than is typical. Even having stayed home yesterday, I can feel myself slowing down, just wanting the kids to take naps so I can too. My high level of energy and enthusiasm from the beginning of the year have taken me this far, but I'm starting to run down. I didn't ask who put "Khan Academey" because I knew I would have to fail them on the spot, both for the reference AND the poor spelling. I taught a fantastic flop lesson in geometry today. We are starting a section on triangle congruence and I wanted them to do some exploration of the postulates before we started listing them. I found a fantastic activity with straws, rulers and protractors! Essentially, the kids did physical proofs of the various triangle congruence theorems and postulates. In about an hour, we only got to part 3. It flopped for a few reasons. I think the students were too excited to be "doing" something to actually listen to instructions like "cut the straws to the following lengths." The number of times I had to repeat it, even though it was written on the board started to get on my nerves. Then, because the straws were cut by hand and, as straws are, were round, it was difficult to get precise measurements. It did mean, however, that we were able to have a discussion about human error. I blame myself for this lesson failure and I can think of a few ways that it could have been better. Have the students work in pairs, rather than groups. There were simply too many kids waiting around doing nothing. This was a function of lack of supplies AND the amount of time it took to move on to the next part of the activity. Have the directions printed out! I thought about this ahead of time, but in an effort to save paper, I passed. This, I think, was a critical mistake. Make sure that there aren't any unannounced programs that will pull half of my class out halfway through the activity. In pre-algebra, I am struggling with the 12 new students who joined us last week. Individually, they are some really great kids. What is frustrating is that after 50+ days, that class had fallen into a nice dynamic and now that is disrupted. The new students do not yet know or understand my expectations and several of my old students have reverted back to bad habits from which they had been broken. I've been pulling a few aside individually to talk to them about my expectations and it seems to have helped a bit. I know that the process is going to take time and when they are fully integrated, the class will not look or act the same way that it did before. In addition to that, the new direction that I have taken the class makes it difficult for me to really know what the class SHOULD look like. I know what I want it to look like (think happy ending of an after-school special) but I also need to be realistic about my abilities to get it there. It is so difficult to stand by and watch students "explore" the iPads. I keep wanting to say "you should be doing something more productive." I settled for a compromise. I've been asking things like "What are you learning right now?" in a way that, I hope, implies no judgement and allows students to justify whatever it is they are doing, or realize that they aren't being productive on their own. I handed out the new workbooks to the pre-algebra kids as well and after went over the warm up, I gave them several options of things to work on, including an assignment from the workbook. While there was a ton of talking, most of the kids were working on something, which made me happy and I commended them for it. Since I'm going to be out tomorrow, I drew another picture for them and I hope I get good answers. Above all, know your students. I learned a ton of stuff about Standards Based Grading and Genius Hour projects with some amazing people, but I don't feel as though I produced anything. As a result, I came in this morning feeling very unprepared. I wasn't even sure HOW to prepare for today and so, without a good place to start, I spent WAY too much time drawing my morning picture. In geometry, we talked about Standards Based Grading and I handed out learning targets for the upcoming chapter. Then I gave them each a set of Proof Blocks in preparation for proving triangle congruence and they worked on the iPads for the Passion Project. Several of them even started blogs to track their progress! I am much more of an old-school teacher than I think this blog portrays. I want to move to a "learn whatever you want" type class, but I'm having tremendous trouble letting go of the control to that extent and trusting the students. Every time I see them on YouTube watching football videos, it's all I can do not to yell at them to get back on task. Instead, I ask them what they're working on and gently nudge them in an academic direction. The thought of the chaos, however, became too much for me today. I didn't want to go back to doing worksheets so soon after proposing this project so I decided on something better! I started my pre-algebra kids on the Big Foot Conspiracy lesson which deals with unit rates to answer the bigger question "Is it fair that people with small feet should pay the same price for shoes as people with big feet?" I thought this would be a great way for them to explore some mathematical ideas that weren't a mental stretch and, at the same time, would foster a culture of mathematics while tapping into their interests. We had a really good discussion about why certain things are charged by weight (deli meat, fruits, vegetables) and some aren't (clothes, books, DVDs). It was hard to do in my 4th period because several students had been pulled out by Wes Lyons, who comes to the school to talk to students about making good decisions. It is a worthwhile reason for them to be pulled and I don't object, but it does make it tough to do longer class projects. When the students returned, however, they slipped right back in with the class with minimal problems. I made sure to pull a few aside afterwards and thank them for it. In the 8th period class, I didn't get through everything because I was tired of being spoken over and interrupted. Yelling is ineffective and only upsets me more. Everyone has off days. I'll try again tomorrow. I'm thinking that in order to satisfy my "old school" side and my "new school" side, I'm going to give them the work books for the coming chapters, but in a flipped-classroom type way. They will be assigned a small number of practice problems for homework and will work on the iPads during class. Those who don't complete the assignments, or don't understand them, will receive the individual attention they need in class. I already anticipate students faking assignments or copying them from other so the warm-ups will serve as a mini-quiz, allowing me to see who understands and who doesn't. I expect that after a few days of me calling their bluffs, they will actually attempt the assignments. In addition to satisfying whatever higher powers may be wondering why I'm "not teaching," I think this plan will satisfy my inner demons who may be wonder why I'm "not teaching." The amount of encouragement that I've received for the original idea (from the internet) has been staggering and I deeply appreciate it. It makes me feel like it might actually be the right thing to do. I am tired. I don't think I've been sleeping well, or running enough and I feel generally not great. I think a sick day may be coming soon. My lack of fortitude is translating into frustration at my students and that isn't fair to them. Also, my daughter turns 4 today, so yesterday, we had a party and I made an apple swan. My 2-year old was not amused. I really should have switched Fall and Winter so I could have drawn a snowman! I didn't even get to talk about what we did in geometry yesterday! On Tuesday, I gave them 3 coordinates and their homework was to tell me everything they could about the triangle with those points as the vertices. Kids came in with statements like "It's a right triangle" and "it's equilateral." We spent 45 minutes exploring the triangle, their statements and whether or not they could be substantiated. It was a great exploration and the kids gave me great questions. At the end of class, I gave them their tests from Wednesday without scored, but with questions marked right or wrong and had them do corrections for homework. Today, I was deeply disappointed by their lack of persistence. I had lots of "I didn't know this, so I left it blank." I explain that I had hoped they would try to figure out the answers, or at least give me some sort of work beyond a question mark with a heart for a bottom point. So they worked on corrections in class. For the most part, the major mistakes I noticed were simply not following directions or not answering the question that was being asked. A universal stumbling point, however, was graphing. So we talked about that as a class. I saw several students who were getting flustered and upset, so I made sure to find them during the day and tell them how much I appreciated them working through their confusion. The warm-up for pre-algebra purposely contained questions from the next section that we hadn't gone over, but could be found with a little bit of thinking. The students (my old one AND my new ones) worked VERY well and we talked about what to do when we encounter a problem you don't know how to solve (solve an easier one) and what to do when you don't understand the directions (break your pencil, yell "this is stupid" and pout). The students were then given a chapter assessment and the unit-reflection and goal setting sheet that I gave to the geometry kids on Wednesday. I had a quiet conversation with one group where, it appeared to me, two students were doing great work, one was putting in half an effort and the fourth was copying answers. I explained that if that was happening, he would simply be wasting his time and wouldn't be getting any benefit from it. I told him that I wasn't accusing him of anything and that if he wasn't copying, my advice was still the same. He did VERY good work for the rest of the class. As I checked their answers, they grabbed the iPads and continued their explorations. As I did yesterday, I spend much the class with a semi-pained look on my face as I fought down the urge to yell "YOU'RE OFF TASK!! Put the iPads away! You've ruined it!" I think my kids were concerned that I had indigestion. After class, I was approached by one of the new-to-me students. He and I have a history that is less than ideal. I am nervous about having him in my class because I think that he has needs that I am not capable of satisfying. I'm honestly not sure that we can provide him with what he needs in this building at all. He's a very smart kid, but every teacher knows that the public school setting is not the best for all students. When he stayed after the other kids had left, I'll admit that I steeled myself for a confrontation. Him: "Mr. Aion, I honestly didn't think that I would enjoy your class, but I'm finding that I do." Me: "...I'm so glad to hear that! This situation isn't ideal, but that's not your fault or mine, so there's no need to make people miserable. My primary goal here is to make sure that kids are safe and learning." Him: "I'm really glad to hear that. I think we'll have a good year." Me: **stunned and playing it cool** "Me too. I hope you have a great weekend." I have no idea how much math they are learning, or will learn, but I am happier coming to work and I think my students are happier coming to class. The content will come. This weekend, I've set homework for myself. SLEEP! FOR GOD'S SAKE! GET SOME SLEEEEEEEEEEEEEP! ...and I have no parachute. First thing this morning, a teacher friend linked me to an article about a teacher in Mexico who gave freedom to his students and helped them to accomplish amazing things. It started me down a path of thought that branched off in odd directions. Thinking also about the Passion Project that the amazing @leslie_su76 was kind enough to share with me, and by the time I got to school, I was speeding so that I could get inside and start changing my entire pre-algebra class. Research has shown that students learn better when they are interested in the topic. In previous years, I didn't care if they were interested and instead focused on the idea of "you have to learn this if you like it or not." This year, I've been trying to make the required material interesting. In geometry, I think I've been succeeding. In pre-algebra, I know that I have not. At the start of the year, I started looking into the idea of Standards Based Grading. Yesterday, I talked about allowing students to create presentations of their knowledge however they can. I spoke with several teachers from several subjects about how to design these assignments and got some amazing ideas. Overnight and from the article this morning, I realized that I have an amazing opportunity. Today, I received 11 new students in my 4th period class. One of those students speaks minimal English. I had originally thoughts about starting the new integrated class with a recap of the rules and expectations in my room followed by a lecture and/or silent individual work. I suppose my thought was that with new students coming in, I needed to reassert my dominance over my classroom. Even typing that now seems a little absurd in light of my complete attitude change this year. Instead, I allowed my thoughts to run wild and by the time students got to school, I was excited, exhausted and terrified. I asked my principal if I could do an experiment in my class for the next few weeks. I used phrases like "pilot project" and "authentic experience" and "technology integration." I'm letting my students decide what they want to learn. The idea is that if they get to pick their own topics, they will work harder on them and delve deeper than if I were to pick the topics. I started by asking them to list things that they wanted to learn more about. They didn't quite understand at first and said they wanted to learn more about integers. Really?? All of human knowledge at your fingertips and you want to learn about integers? That MAY be true, but I don't believe you. I explained my idea and also some of the major issues. I explained that we were going to pilot this type of learning for the district and if we messed it up (because it wouldn't be they, or I, but definitely "we") than the district would be able to say that exploratory learning was a failure and we should only work on text books and worksheets forever. If, however, we succeeded in doing something amazing, we may just be able to change how students in the district are educated. I MAY have exaggerated a bit, but they got the point and understood the importance of the experiment. I made a deal with them: If they found something they could be passionate about researching, and would research it passionately, I would find the math in it in a way that was real and interesting. I then handed out a class set of iPads and let them loose! Their goal for today was to explore the iPad and the internet, looking for things they found interesting and would like to learn more about. By the end of class, they were to come up with at least 4 topics that they might want to explore further. Then I stepped back and let panic set in, mostly my own. How could I just give up control of my classroom like this?? What happens if they don't learn anything?? I think 4th period (now with 2X the kids!) thought it was a trick. Several of them tried to upset me by looking up videos about football, or music videos with Beyonce, I turned it around on them. Me: "What are you looking up?" M: "Cool! What about football do you find interesting?" S: "The players are cool." M: "Nice. What about that guy? He any good?" S: "He's alright. He's not as good as Hines Ward though." M: "Really? What makes someone a good football player?" M: "Interesting. Would that kid over there say that this guy was better than Hines Ward? Is there a way that you could say for sure who was the best, even if they played different positions?" As I wandered the room, actually shaking from nerves, I saw an interesting mix of reactions. Several students were exploring the iPads, opening apps and testing things out. A few played Wuzzit Trouble, and a few other math game apps. I even sent a few to Math Munch. In 8th period, several students laid down on the floor and began browsing the internet. I walked around the room and sporadically asked "What are you reading?" She was reading about blobfish. Another student was looking up zoology and kept spouting off facts from the net. Another was researching how to become a lawyer. A few students were using iMovie to make some videos and I heard "That's awesome! How did you do that?" Learning was happening. There was not 100% engagement, but there was more than my typical lessons. I have very high hopes for this, but I am scared out of my mind. After talking with our literacy coach, I felt MUCH better. She sent me some resources and we talked about how to focus the students. I do wish that I had taken more time to plan this before jumping in with both feet, but I also know myself. I know that if I didn't start this right away, I would ponder over it for weeks and it wouldn't get done. That has happened with other amazing ideas that I had in the past. Jumping right in will FORCE me to do it and my renewed work ethic will force me to do it well. I've started working on a "Genius Hour" workbook so students can identify SMP for whatever they want to be learning. It's an evolving idea, but it scares the crap out of me. My morning question and picture prompted me to give my students an impromptu lecture on the achievements of LeVar Burton as both an advocate for education in general, reading specifically and as a strong, positive, African American male role model. I gave bonus points to the kid who was able to come up with the name "Geordi laForge." For almost this entire school year so far, I have been in assessment crisis. As I have talked about before, I can no longer justify the grades that I give students as I don't think they are an accurate representation of learning. I have yet, however, to figure out how to fix this. I love the idea of moving towards Standards Based Grading but I have yet to find the time/energy to make the major shift or to sit down and examine the standards the way I want to. I've found amazing resources and support on Twitter (@algebrainiac1 and @WHSRowe to name just two) but taking the leap has been more difficult than I anticipated. So I've been doing what I think is the next best thing: I've been playing around with different assessment types. My geometry class has been the perfect group of Guinea pigs for this because they are so excited to try something new and they trust me. They trust that if it flops, I'll hold myself accountable and not them. Previously, I did a group test where students were not allowed to talk for the first 20 minutes, but were allowed to pass notes back and forth within the group. That style worked very well with the geometry kids, so I did a modified version today. They had a group test, but were not allowed to talk at all! For the entirety of the assessment, they were only able to communicate with their group mates by passing notes. This may seem like eccentricity, but my goal is to get them to think about their processes and be able to not only explain it to someone else, but to be able to write about it. Students fill out the first 4 columns during the assessment and the last 5 after it has been graded. After a thorough explanation of what I expected of them today, I asked for any questions. As I expected, I got one about grades. I explained again that good or bad grades do not reflect on them as people or as students. It is a vague measure of their understanding, but not the only one and certainly not the most important. Assessments are times to learn, not material, but to learn how solidly they grasp that material and are able to retrieve it as needed. "I need you to understand something else as well. No matter how well, or how poorly, you do on this test, I am deeply proud of each and every one of you. You have come with me on this incredible journey, maybe with skepticism at first, but now with energy and enthusiasm. You are amazing people and you are doing incredible things. I am so very proud of you and, more importantly, you should be proud of yourselves." The assessment was too long. The kids were working well, but about half of them didn't finish in the time they had. This could be partially due to their familiarity and comfort with material, or familiarity and comfort with the skills sheet and process. Because they put the work in, I'll grade it and give it back, but I think instead of putting that grade into the book, I'll let them make corrections and turn in a corrected copy. It's opened ended with tons of possibilities for students top explore and it will lead very nicely into our next conversation about triangles. Describe how you might demonstrate that you completely understand a topic. Several students needed clarification for this prompt, giving me answers like "you could show your work." While I suppose this is true for the question I asked, it's not the line of thought I was hoping to induce. So I changed my line of questioning and the answers I received were VERY telling. Me: "If someone claims to be a cook, how do you know if they are a good cook?" Student: "The smoke alarm don't go off." M: "So, anyone who doesn't burn the food is a good cook?" M: "Then what else? How do you know if someone is a good cook, other than the fact that they don't burn their food." S: "They can mix stuff." M: "I think that might be more process than outcome. How could we show the outcome of being a good cook?" S: "They can follow a recipe?" M: "Again, I think that might be process. Do you need a recipe to make you a good cook?" S: "If the food looks good and tastes good?" M: "What do we think? If someone makes tasty food, does that make them a good cook?" M: "So, making something delicious would be a good way to demonstrate that you know how to cook. Is there a way to show that you know the concepts in math class, other than taking a test?" S: "You could show your work!" For a school bake sale, each student has been asked to bring 6 dozen cookies. Help Eva plan for the bake sale by completing the exercises. Eva has chosen a recipe that makes 2 1/2 dozen cookies. The expression 6 / (2 1/2) can be used to find the number of recipes that she should make. Explain how to evaluate the expression. Then evaluate the expression to find the number of recipes Eva should make. Express the answer as a fraction or a mixed number in simplest form. I don't love this question for several reasons, but the main is that I was worried that it was telling them specifically what to do. I needn't have worried about that. I should have worried about other things. I spent the next 45 minutes going between groups and explaining what they were being asked to do. Once the question became clear, it became obvious that the majority of the students had no idea how to do it. When I suggested that they take a look through their notes or text books to find a method, they were lost. I don't even know where to begin with this. It's as though we hadn't spent the last month and a half going over fraction operations. On top of that, many of the students couldn't even get to the idea that they were supposed to divide 6 by 2 1/2 even though it was explicitly laid out for them. The purpose of this assignment was to move them beyond just number crunching and starting thinking about HOW they solve problems. I'm not sure what to do. The first class had an amazingly difficult time with it and most of the students gave up unless I was standing over them. I had them working in groups so that I could assist more than one student at once, but students worked until they didn't get it (a sentence or two in) and then just sat and waited for me. I tried to tell them that I would be with them as soon as I could and that they needed to keep trying until I got there, but they wouldn't. When I worked with the groups, holding their hands a bit as we walked through the first question, they were following along, but not well enough for me to think that it was just a misunderstanding of the directions. Tomorrow, this class will have an additional 11 students who are coming from another teacher. They are not at the same place in the curriculum as my students and now, I don't even know where my current students are. I need to think long and hard about the cause of this problem AND how to fix it quickly. Some of the causes are obvious to me and lie at both my feet and the feet of the students. At the end of class, I asked them to please finish the assignment tonight, rewriting it neatly if necessary. At least 7 students left their papers in the room. I'm so tempted to fall back into "I know I taught it! They just didn't learn it!" But the reality is that if they didn't learn it, I didn't teach it. So now I am put in that difficult position where I have to decide what to do with my math 8 classes. Do I move on and try to incorporate as much spiral review as possible? Or do I go back and attempt intervention with projects and problems dealing with concepts that they didn't master? Or...I don't know. I have some thinking to do. And I have to figure out how to incorporate 11 new students into my classroom. I finished my day by blasting the Duran Duran station on Pandora, grading the geometry quizzes (not great) and amusing myself by referencing PeeWee Herman. Contrary to what my coworker thought, that is not a hijab. It is a raincoat. I have never claimed to be perfect. I don't think I've even claimed to be good. The whole point of this reflective blog is to help me to become the teacher that I want to be. It gives me a chance to take a step, take stock of my thoughts and improve upon them next time. In geometry, we did the warm-up, discussed the various methods that students used to solve the problem and moved to our review game. I will happily give credit to @MissCalcu8 for Balloon Pop and to @NathanKraft1 for his hatred of review games! Basically, you split the class into teams and give each team balloons or tokens, or something along those lines. Then you begin to ask questions. If a team gets an answer right, they get to pop a balloon on another team. After they have been eliminated, a team can still seek revenge by popping balloons. Since I had 7 teams and only 4 balloons for each team, I was worried that they would run out of balloons WAY too quickly. In theory, the whole game could be over in 4 turns! So I added a wrinkle. When a team got a question right, they could pop a balloon on an opposing team, or they could steal one! This immediately started teams forming alliances and talking strategy. Things got VERY heated, but because there was so much at stake, everyone seemed to be engaged, arguing their points with their group mates so they would get the chance to pop or steal. The students became VERY attached to their balloons, decorating them and begging other teams not to take them. Others got joy out of popping the "friends" of other teams. Using actual balloons for this review is NOT for the faint of heart. The kids were rowdy and loud and bouncing around the room. They were yelling at each other and at me. It would be VERY easy for this review to get out of hand. With that said, this was great! They were rowdy, but on task and even kids who are normally disengaged were heavily involved in strategy, problem solving and balloon hoarding. The majority of the students entered the room and refused to even attempt the warm-up. Two students "attempted" it, but their answers made it clear that they thought I wasn't going to check their work. In previous years, students got a grade every day for putting an honest attempt into the warm-up. I think I may have to go back to that when my 10 new students enter the room. I can handle a student or two blowing off the warm-up on occasion, but not an entire class. I'm sorry to say that my frustration and anger got the best of me. I assigned them two practice sheets to work on individually and silently. Since I NEVER do this, they realized pretty quickly that they had done something wrong and worked very hard. When they finished, and asked "what do we do now?" I had them continue working on their Thanksgiving Day projects. Most of them had finished with the recipes and were ready to start scaling up. As they worked, I told them that I appreciated them working hard and I handed out iPads. When they started looking up food prices, they realized that things like vegetables and turkey aren't advertised on walmart.com and they might actually have to go to the store to find some prices. Judging by the motivation of many of these students, I fear that this is where the bottleneck will occur. I'm going to have my colleagues and the students bring in circulars from the supermarkets so we can use those as well. As usual, something I should have planned BEFORE now. I hate that I have to punish them to get them to do what I need them to. To be clear, the work wasn't the punishment. The punishment was being forced to do it on their own instead of with a partner or group. I do my very best not to assign work as punishment. I am constantly amazed at the different dynamics of different classes. I know that every kid is different with their own strengths and weaknesses, but I think there are still some generalizations that can be made about different classes. For instance, my geometry students are, in general, more academically motivated. For reasons on which I won't speculate, they see good grades as almost more important than anything else. As a result, they move quicker through the curriculum and are now "advanced." Even the differences between classes on the same level are stark. The afternoon math 8 class dove right into the warm-up and, while they had difficulty with it, they worked well. I wonder if the work ethic in the two classes would reverse if I had them at reverse times. There are just too many factors involved in the academic motivation of students to be able to boil it down to a few simple things. I will keep trying and continue to figure out how to get them to complete tasks without my pulling teeth. I need to find or develop a task that is essentially "Show me that you know this material, however you can and want!" The kids didn't answer my whiteboard question today, so I'll ask it again tomorrow! Long weekends are tough for me. I don't plan them well and, as a result, I plan LESS for the coming week than I do during a normal weekend. "I have 4 days! I don't need to do it now!" I say to myself every day. When I came in today, however, a district level administrative decision threw me for a loop. The size of one of my classes will be almost doubling. Please note that it is Day 51. My principals know my objections and the reasons for them, so there was no reason to vent at or to them about my displeasure. I also won't waste time on here with the reasons that this decision was made because they don't matter..
Needless to say, I am a bit out of sorts. I explained to my 4th period that we would be getting 10 new students, went over the warm-up and gave them the team-quiz review. I'm having trouble keeping a positive outlook and I'm worried that my frustration is going to show through and be taken out on the wrong people, so I'm trying to keep to myself, as much as a teacher can. The students were not as on task as I would like them to be, but they were working. When I offered candy to the winning team 9th period, they buckled down and started doing some great stuff. It showed me that this idea wasn't too shabby! I'm very displeased with my attitude today, but I'll justify it by saying that I've been putting full effort into what I've been doing since the start of the year. I don't think I deserve a break, especially after 4 days without students, but I'm not the best me I can be today. It may bother me later, but for now, I'm alright with it. Last year, I would have been upset by this for a totally different reason. I wouldn't have wanted all these new kids out of my own laziness. This year, I'm upset because there is simply no way to justify that this move is in the educational best interest of any of the students involved. I spent the morning observing Mrs. Reilly in her natural environment. I saw a geometry class and two physics classes. It was a wonderful experience and VERY different from the school where I teach. It was a shock, in between classes, to NOT see students riding on each others backs, screaming down the hallway. Also, the fact that there was light and air in the hallway was a welcome change. In addition, I found it very interesting to watch someone teach classes that I teach. I think that in the past, I would have spent much of my time thinking either "that's cool!" or "I could do that better." This time, I spent a lot of time thinking about how I interact with my students and the types of questioning that I utilize. After each class, we talked about the various students and their needs in terms of content and attention. We discussed ways to modify the presentation for future classes. We talked, generally, the way that colleagues who care about improving their craft are supposed to talk about an observation. She looks awesome and I look like an escaped mental patient! Then I went back to my school for conferences! The style of conference adopted by my school is one that I deeply love. Instead of having parents wander the building looking for teachers, all of the 7th grade parents convene in one room while the 8th grade parents meet in another. They sit at a group a desks at put their child's name on a card. The teachers then sit down with the parents all together and discuss the progress of the child in all of their classes. The process builds incredible communication, allows teachers to know what the others are saying to the parents and creates an air of community for the teachers as a whole. In my previous years, I spent much of the conference time saying things like "He doesn't bring his materials to class" "she doesn't complete her assignments" and "he comes in, refuses to do any work and puts his head down." While true, all of these conveyed the same message: This is why it's not my fault that your kid is failing. This year, the conferences were VERY different. I spent much of the time laughing and joking with the parents, trying to develop creative solutions to get the kids back on track to success and generally having a good time. Several parents told me that their kid loves my class and can't stop talking about all of the things that we do and talk about. One set who brought their daughter with them, told me that I had changed her life. She used to spend hours crying about doing her math homework and now she LOOKS FORWARD TO IT! They thanked me for feeding her on days when they couldn't and for making my room a place where she felt safe. Another set expressed their concern that their son was full of amazing ideas but had trouble getting them out. His spelling is awful, but his minds works on a level that I find astonishing. I suggested that they have him start a blog. Getting his ideas down, even just a few minutes each day could help to clear his mind and direct his thinking. I told them that I started the practice as well and how it has helped me tremendously to keep my thoughts organized. I also told them that I would be extremely interested to read his blog if he and they choose to make it public. I expressed my concern to another parent that his daughter might be starting down the path to being a "mean girl" and how desperately I didn't want that to happen. She's so kind and sweet and I love her to pieces, but I see undercurrents of bossiness that, if directed properly, could make her an amazing leader. At several points, I introduced myself and received the response "Oh! So YOU'RE the one!" One parents said "the infamous Mr. Aion." It was wonderful to be able to tell parents about the growth I have seen in their children and how proud they should be. I'm really not comfortable tooting my own horn. I'm trying to make math class interesting for the students and for me and the results seem to be pretty positive. I am starting to think that I may actually be doing something right this year. I will only take partial credit for it. The rest goes entirely to the wonderfully creative and encouraging teachers that I have met through Twitter and #MTBoS. With that said, 95% of the conferences I attended were for my geometry students, who are highly self-motivated and often strive to please their teachers. Many of the parents that I truly NEEDED to see were unable to attend. Me: "Hello. I'm Mr. Aion. Can I help you?" P: "I understand you hollered at my daughter." M: "I'm sorry. Who is your daughter?" M: "...I don't know who that is." M: "Oh yes. Well, I did have an interaction with her last week where she felt it was acceptable to talk to teachers as though they were her friends. I expressed to her at that point that it was inappropriate to do so. My job in the morning is keep students moving towards homeroom and she was loitering outside of my room. I asked her to move along and her reply was not appropriate. So I reiterated my point in a more authoritative fashion." P: "She says you hollered at her." M: "I don't holler at anyone. But I'm sorry if that was how it was perceived. I will apologize to her on Monday for the way I came off." I think a year ago, that would have ended MUCH more unpleasantly. I suppose I may be learning from my mistakes!